According to a statement from the Pentagon, President Donald Trump really wants to throw a military parade, and it’s looking like it might actually happen. Trump apparently ordered the Pentagon to plan a patriotic military parade inspired by France’s Bastille Day parade, which Trump was a guest at last year. However, many are pointing out that large public displays of U.S. military strength aren’t very, well, American. The last military parade was in 1991 to mark the Gulf War victory. Daily tributes were held across the country to welcome home troops who had been part of Operation Desert Storm. The biggest celebrations were in New York and Washington, where Patriot missile systems were on display. Helicopters flew over the Washington Monument and Army General Norman Schwarzkopf Jr., the chief of U.S. Central Command, led troops through the $8 million display. Meanwhile, New Yorkers assembled and carried a giant American flag along Broadway as part of Operation Welcome Home. 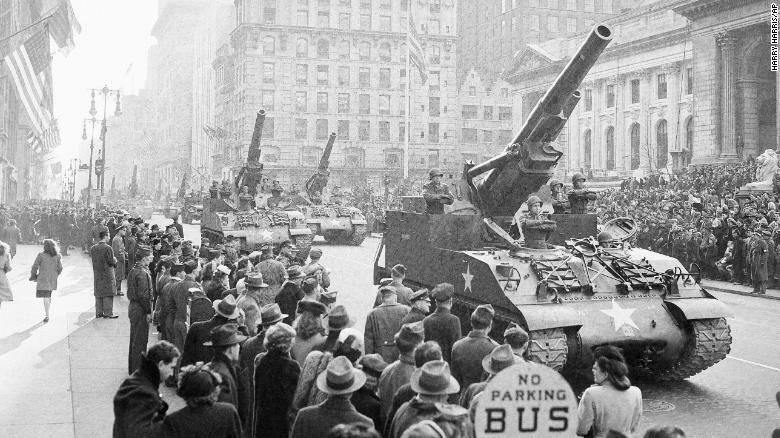 Other notable moments included both President Dwight Eisenhower’s 1953 inauguration parade, as well President John F. Kennedy’s 1961 inauguration parade — both of which showcased missiles and tanks (though they weren’t technically “military parades” per say). Trump’s decision has garnered widespread criticism, with The Associated Press reporting that, with the exception of specific holidays like the Fourth of July and Veterans Day, the U.S. typically doesn’t participate in “gaudy displays of military hardware” that are more characteristic of authoritarian countries like China and North Korea. Press Secretary Sarah Sanders has state that Trump wants this event to be “a celebration at which all Americans can show their appreciation.” Interesting, especially because Trump personally deferred military assignments five separate times when he was of service age.